Yune stops to listen to a guitar being played in the Galerie du Roy. There were Internet rumors about a bonus episode of Ikoku Meiro no Croisée (Crossings in the foreign labyrinth). 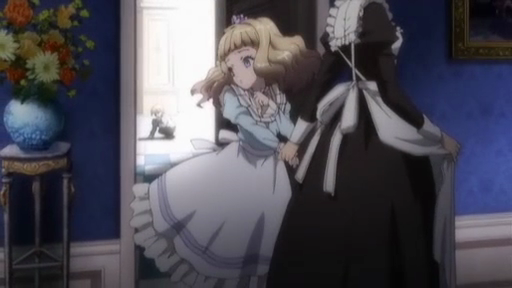 This episode, which comes between 4 and 5 has appeared, and it relates to the relationship between Claude and Camille, which has been growing in importance. As those following the series know, an important theme is the contrast and occasional misunderstandings between cultures (especially Japan and France). In some ways this theme is inverted in episode 4.5, and we see instead how, despite superficial differences, commonalities remain. 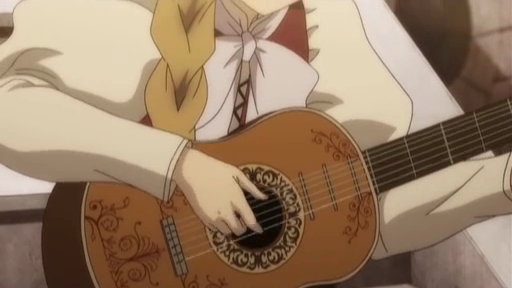 Lovely detail on the guitar. Claude is his typically disagreeable self. When a wandering musician arrives at the Galerie du Roy, playing arrangements of traditional Japanese songs, Yune is fascinated, but Claude forbids her from getting involved. He says that such people cannot be trusted. She agrees to “follow his instructions”, even though Oscar wisely points out that, “If you are afraid of new encounters, your life will end up being very boring”. Alice invites Yune to a concert so she can hear the Japanese music. Since Yune is the only one who knows the Japanese lyrics, she is asked to sing. The Japanese songs played are not only traditional, they often are associated with childhood, such as Zui Zui Zukkorobashi, which is about half onomatopoetic, thus when Yune tries to explain it’s meaning to Claude, it sounds like proper nonsense. 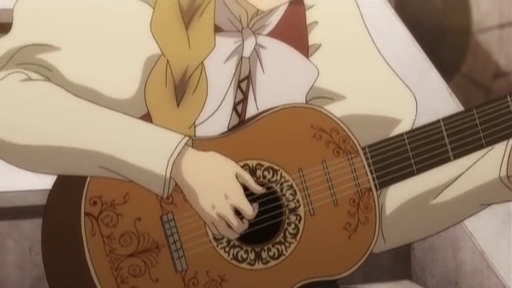 Alice is also shown misunderstanding the role of traditional Japanese instruments. She tries to play a type of wooden bell called a Mokugyo that is used in Buddhist temples, and she gives Camille what looks like Shakubyoshi, a type of wooden clapper, neither of which are appropriate to the children songs that Yune is singing. There was some very nice animation of her right-hand technique. 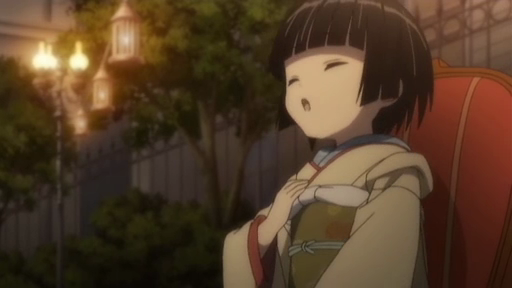 Yune sings along. It has gotten late and the lamps have already been lit. 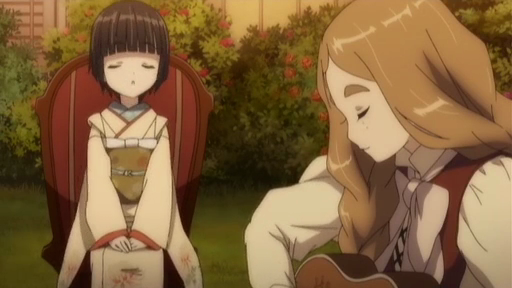 After a while Yune and the wandering musician, Ana discover that they have a connection through music, especially a particular song written by Ana’s grandfather for a woman he loved, but left behind in Japan. Yune’s sister seemingly met Ana’s grandmother, and the song was passed along. This begins an interesting segment in which Camille shows one of her rare flashes of darker emotion. Typically she is, as Alice noted, the perfect lady. On occasion we have seen suggestion that there is a bitter grimace behind the smile. Ana’s story about how her grandparents couldn’t be together, except by both sharing the song triggers an outburst. Camille Blanche. Deep emotions hide behind the lady-like facade. Ana remarks that, “In every era, there are things that won’t allow you to be with the one you love”. Ana has a life that enables her to wander freely. As we have seen this past week, Camille is very protective of Alice’s freedom precisely because she has none of her own. 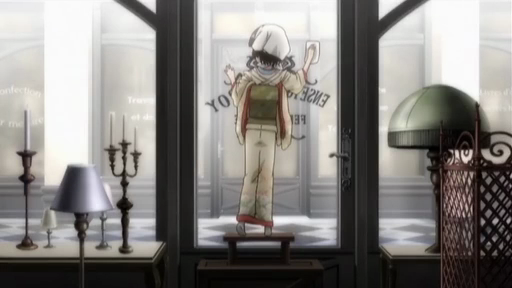 As Yune sings the song about loving someone far-away, we see a montage that shows it to be a common experience in the human condition, and even see the following image that appears to be Camille as a child being dragged away from Claude. To Camille's family, Claude is the dirty, untrustworthy other that must be avoided. 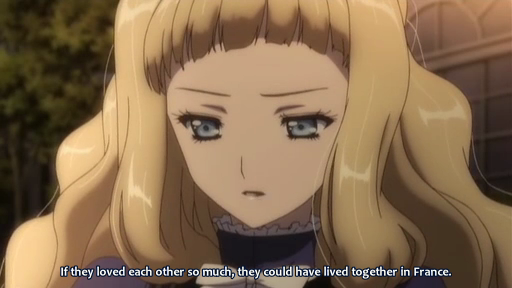 If I wasn’t already (and, honestly I was), this episode would have sold me on Camille and her doomed love for Claude. I enjoyed the calm pace of the early episodes, but I am really glad that Ikoku Meiro no Croisée is building up the tragic love story of Camille and Claude. I’m really interested in seeing what happens. We seem to be heading towards Camille’s marriage. She is destined, it seems, to marry someone rich for the sake of her family. Although Claude can be criticized for treating others in the same bad way he has been treated, it is notable that all of his talk about freedom really amounts to treating Yune as he must wish Camille was treated. 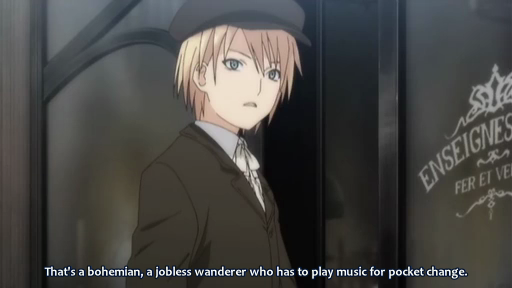 That is, though he mistrusts the lower classes (the petit thief, and the wandering musician), he offers the freedom to Yune that was denied Camille. 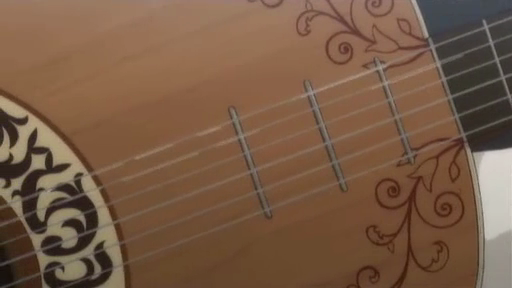 The music for this episode was simply gorgeous, not to mention I’ve never seen such awesomely animated guitar playing. Camille and Claude’s relationship was always the most interesting thing about this show, to me anyway. While I almost don’t want to believe that this show will take the more realistic and darker route (Camille marrying some noble for the sake of her family), I kind of can’t see anything but that happening. Yes, I want them to end up together, but really that’s just the romantic in me speaking. Camille’s true feelings about her standing in society have been hidden rather well, but will she really be able to choose her family’s happiness (more like prosperity and success in high society) over something she truly desires? I hope she doesn’t, but like you said, she’ll most likely sacrifice her own freedom in return for Alice’s. As you say, it is difficult to imagine us getting from here to an ending in which Claude and Camille are happily united. I do think an ending in which Camille is forced into a loveless marriage is also Romantic, not happy, but Romantic. I would even say that impossible love is more Romantic than a normally happy relationship. That’s why so many classic love stories end in suicide. It’s more Romantic to kill yourself because you can’t be with the one you love, than to live on as a married couple. Although Jenny Holzer famously said, “Dying for love is beautiful, but stupid”. I doubt that Camille will kill herself, but sacrificing her own happiness for the sake of her sister, is a form of dying for love. Regardless of how it turns out, the show has put an interesting topic on the table.